More than half of college students are addicted to their cell phones, according to a study from the Journal of Behavioral Addiction. Students who were surveyed reported feeling anxious without their phones, and on average, college students reported spending nearly ten hours a day on their devices. Scientists conducted a study among 2,500 college students to observe cell phone habits and found that our frequent smart phone use may actually be an unhealthy behavioral addiction. The study reported that 60 percent of the college students admitted to feeling addicted to their smart phones. The large number of students who rely heavily on their cell phone signals the transition of cell phone use from a habit to an addiction. Of the 2,500 students surveyed, students admitted to spending an hour and forty minutes each day on Facebook alone. According to the data, 67 percent of people aged 18-24 own a smart phone instead of a standard cell phone. The survey also revealed that most people reach Facebook through their phone opposed to their computer or tablet. Based on these findings, the study hypothesizes that non-smartphones may soon become obsolete. I never go anywhere without a book to rest on my lap while I look at memes on my phone. I'm addicted to my phone. It's a love/hate relationship. Like a bad boyfriend you know aint good for you but just can't quit. That's all. And this probably isn’t news to you because chances are you’ve heard it so many times before: “Kids these days are always on their cell phones,” but maybe you just shook it off thinking it wasn’t that big of deal. But researchers say that it is a big deal. Students admitted to spending more time on their phones than they should, and that amount of time is only increasing. Students reported that they felt more agitated when their phones were not in sight, or that they became nervous when their phone battery depleted. My phone was dead for 5 hours today and I have never felt more anxiety in my life. 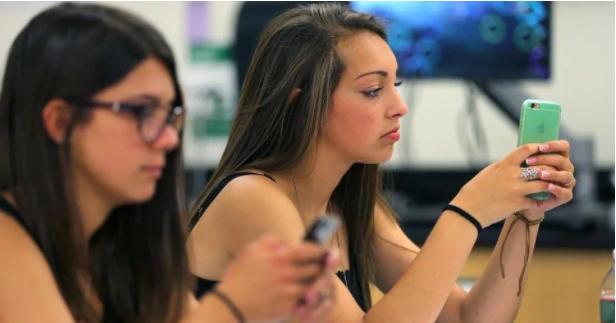 According to this research, cell phone dependency can undermine academic performance because it distracts students during class and allows students the ability to easily cheat. Cell phone addiction hinders the workplace as well and can strain relationships between students, parents, professors, and employers. Most of us can agree that we take our cell phones nearly everywhere we go because otherwise, how else would we snap a picture of our day spent in the city, instagram our lunch, or just communicate with one another in general? So think about it, when’s the last time you were using your phone when you were really supposed to be doing something else?